Bubby and Bean ::: Living Creatively: GIVEAWAY // Win a $75 Shopping Credit to GroopDealz! 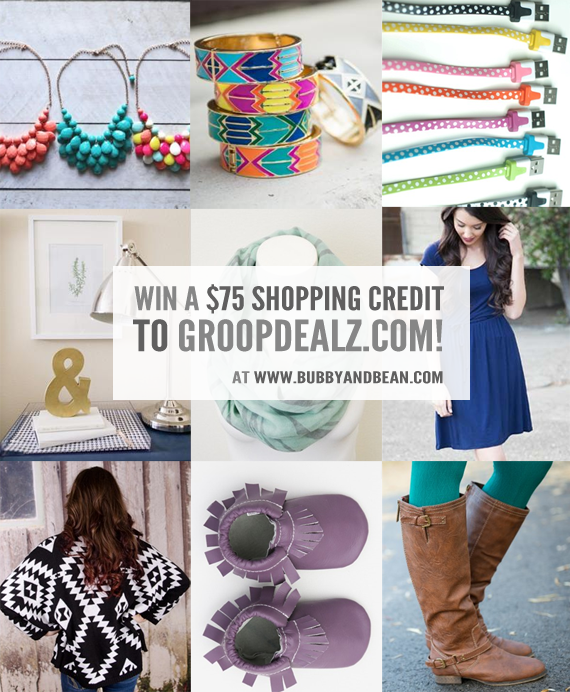 GIVEAWAY // Win a $75 Shopping Credit to GroopDealz! I'm so excited to be teaming up with my pals over at GroopDealz today for this amazing giveaway! 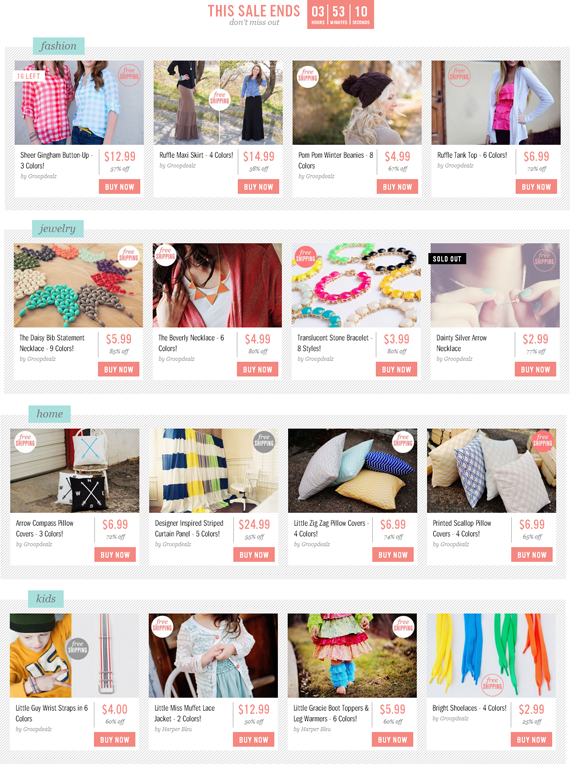 For those of you not yet familiar with GroopDealz, every single day they have new curated deals on stylish clothing, jewelry, home goods, kids goods, and more - up to 75% off regular price. I think my favorite part (aside from the huge savings, of course) is that although they offer deals for larger brands that I love like Anthropologie and Kitchenaid, so many of the products they showcase are from small, independent companies. I also love getting their emails and getting to see what deals they have going that particular day, right in my inbox. And now they're giving one lucky Bubby and Bean reader a $75 shopping spree! To enter, just visit the GroopDealz website, then leave a comment below telling me your favorite deal for that day. That's it! This giveaway will run through March 13th and is open to Bubby and Bean readers worldwide. The winner will be randomly chosen and announced shortly after. (Important: Please make sure to check back and/or leave a way to contact you in your initial entry!) A huge thank you to GroopDealz for giving Bubby and Bean's readers a chance to win this fun shopping experience! I like the "everyday I'm hustlin" tea towel! Love their "Everyday I'm Hustlin'" towel! I love the 18" wood monogram! I like those pillow covers! Oh I love the bubble earrings and the geometric necklaces! And I like your post on FB! I already receive their emails with 2justByou(AT)gmail(DOT)com. I already follow them on Pinterest (@justByou). I already follow their instagram (@2justByou). Great giveaway! I love the Neon Rose Spring Scarves! I like this post on FB. I love the decorative pillows! My favorite deal of the day is the Decorative Pillow Covers in Green Chevron! I already receive groopdealz emails! I already like GroopDealz on Facebook. I follow GroopDealz on Pinterest (kendall608). I follow on Instagram (@seabattle2). My favorite deal today is the neon rose scarf from So Lola Boutique. My favorite deal today is the Dainty Geometric Necklace in silver! I also liked groopdealz on facebook! Colorful and adorable blogsite, lots of inspiration. Thank you for this lovely giveaay! I love the Heather Riding Boots! I'm signed up for GroopDealz emails. I followed GroopDealz on twitter! I love the decorative pillows! So many options! Signed up for GroopDealz emails. love the lace tops & knit tunics! I love the V-Neck Honey Knit Tunic - 6 Colors! Facebook fan of groopdealz. amy bolda pugmire. I love the Dainty Geometric Necklace in Gold- it's only $5.99! I subscribe to their emails. I like them on FB as Katy M.
I follow them on Twitter as @katygmorris. I follow them on IG as @katygmorris. I hit the facebook like button! I love the teething necklace!! My little guy is 4 months young and will be teething soon! The teething necklaces are so pretty and useful too! the chevron and chain link pillow covers! Today's deal on this batwing shirt is awesome!! I love the Chevron & Chain Link Accent Pillow Covers! I receive the GroopDealz emails already actually!